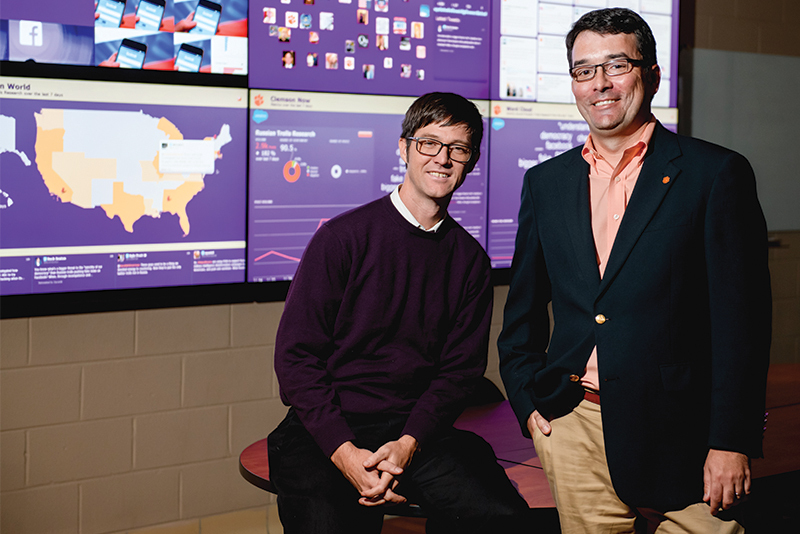 Clemson faculty members Darren Linvill and Patrick Warren are studying the activities of social media accounts created by Russian agencies to influence elections and political discourse. In 2018, they identified over 3 million individual tweets by these types of accounts, a sharp contrast with previous reports of only a fraction of that number. They’ve studied how these “trolls” work and what the timing and frequency of posts have to say about their intentions and efficacy. After making their data publicly available, the duo continues to gain international attention as news agencies examine the data and seek their expert knowledge to explain it. With all the news surrounding Russian trolls on Facebook, both researchers agreed in late 2017 that they should at least attempt to use the Social Studio software housed in Clemson’s Social Media Listening Center to investigate whether the problem with troll accounts was better or worse than reported by Twitter. Linvill took the time to examine every account one by one to verify suspicious activity, and in the process, he has helped people falsely accused of being trolls clear their names with Twitter.